Sword Art Online: Hollow Realization Deluxe Edition is heading to Switch in Japan on April 25, Bandai Namco has announced. Pre-orders will open on January 17. 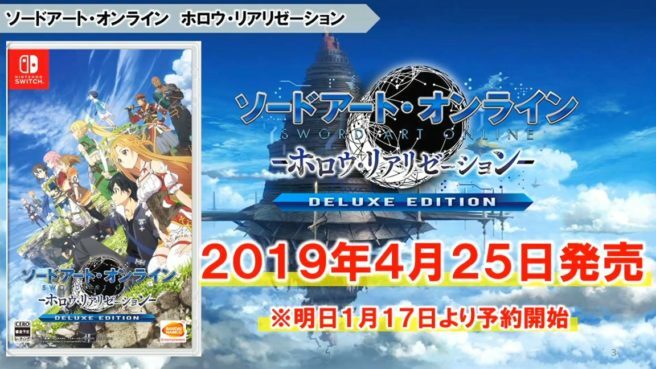 As the Deluxe Edition name implies, DLC will be in the package. That includes all three chapters of the Abyss of the Shrine Maiden DLC. Sword Art Online: Hollow Realization Deluxe Edition will also be distributed in the west. However, Bandai Namco has not confirmed the overseas release date at this time.